It was an interesting experience attending a webinar at a local cafe on 11th February 2017. 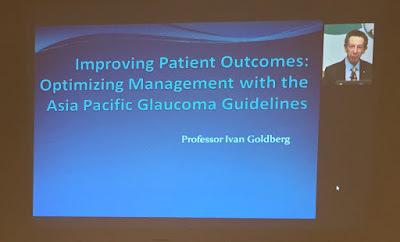 Dr Ivan Goldberg, AM, FRANZO, FRACS, an Associate Professor at University of Sydney presented the webinar on "IMPROVING PATIENT OUTCOMES: OPTIMIZING MANAGEMENT WITH THE ASIA PACIFIC GLAUCOMA GUIDELINES". Dr Ivan discussed the recent Asia Pacific Glaucoma Guidelines, presented at the Asia Pacific Glaucoma Society Conference, held in Chiang Mai, last year (2016). He explained how these guidelines are easy to understand and use in daily practice. Sincere thanks to Pfizer for making this happen. Thank you Kathleen. Telemedicine is breaking walls and bringing quality medicine across the globe.